To start my muslin for the Ralph Rucci Coat, Vogue 1419, I must start by implementing a few flat pattern adjustments that my figure requires in commercial patterns. First and foremost a Broad Back Adjustment. The coat pattern is rumored to run snug; slim fitting at the bust and through the waist therefor I have decided it would be in my best interest to complete a full broad back adjustment. This will allow additional ease for the back waistline and hip. 1. On the Back piece #9, I drew a line parallel along the Center Back fold line. My line was 4 inches into the pattern from the CB fold line. I stopped my drawn line at the mid upper back (the circle in the above photo). 2. 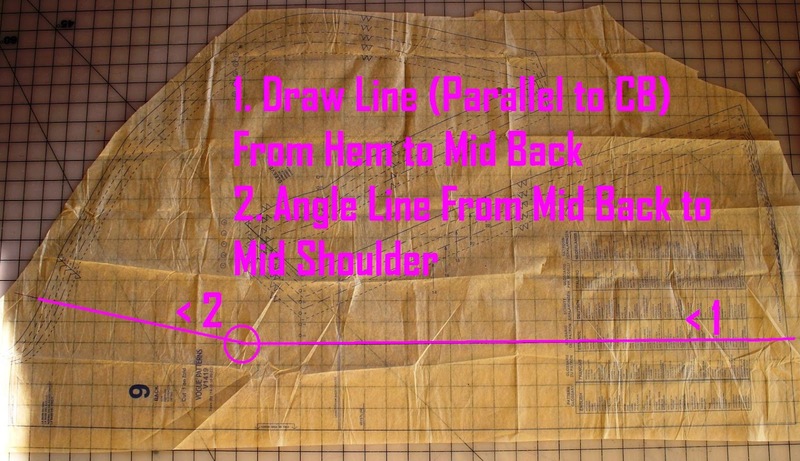 I angled my line to the Mid shoulder point; between the neckline base curve and the seam notch. 3. Cut along drawn line intersecting pattern piece. 4. Add scrap paper along one side of the cut edge. Mark another line parallel to cut edge the width desired for back extension. 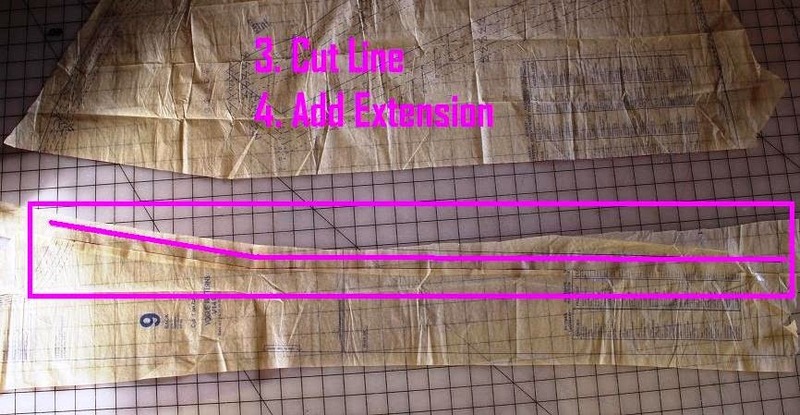 The pattern upper back measured 16" and my back measurement is 17", I need a 1" total extension thus 1/2" extension on piece #9 which is cut on the fold. 5. Tape the other half the the back to the extension line. Piece #9 will be eased onto the #7 shoulder pieces between the neckline base curve and the seam notch to accommodate the added back width. 6. 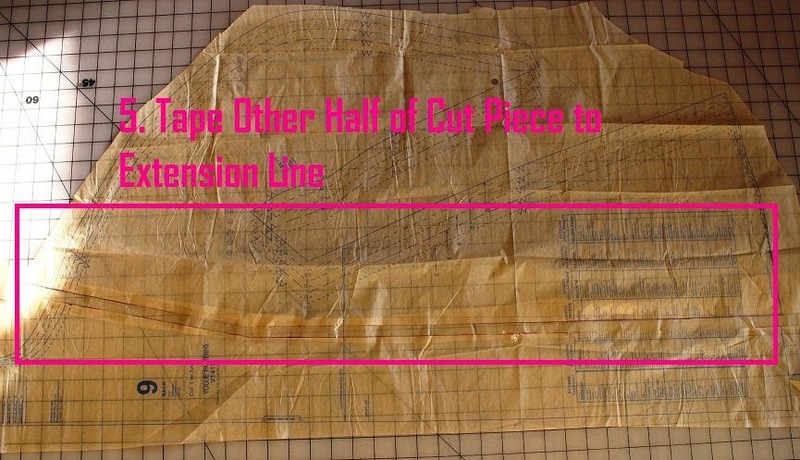 Additional width must also be added to the back belt piece #6. To do so I added my 1/2" extension to the belt side. 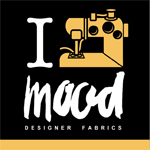 Thanks for showing this pattern alteration so well. I'm sure you're coat is going to be amazing!!! 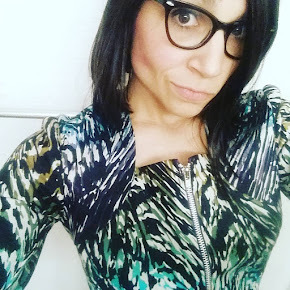 Thanks for sharing this pattern alteration, I can't wait to see the finished coat!